It appears that Republican Vice Presidential candidate Mike Pence has been watching “Monty Python’s Flying Circus.” Not just watching, but channeling. 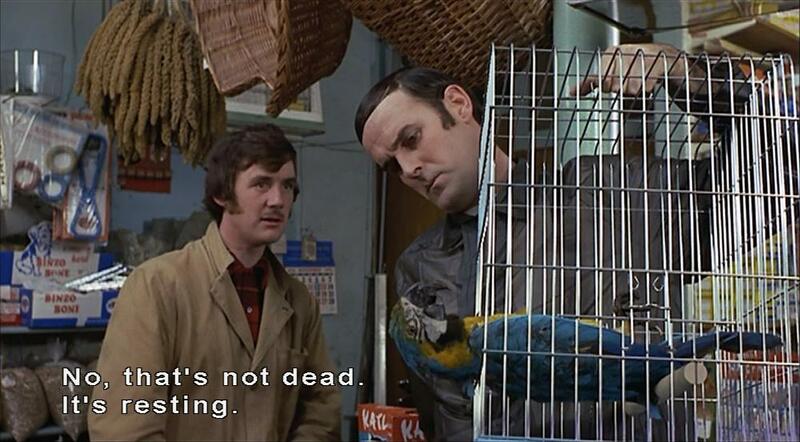 In the Vice Presidential debate last night, Pence did a pretty good imitation of a character played by Michael Palin in the famous, hilarious, “Dead Parrot” sketch, which first aired in 1969. We can see that the bird is dead. He can see that the bird is dead. And the customer can see that the bird is dead. But the shopkeeper simply stonewalls, throwing out multiple alternative descriptions for what is clearly a dead parrot. As I watched Pence’s performance last night, I kept thinking of that scene, as Pence repeatedly shook his head and denied that Donald Trump has said what he actually, very publicly, has said. The Monty Python guys would be proud.